A financier—his fortune was built on steel—Mellon was appointed secretary of the Treasury by Warren G. Harding. He served under Harding, Calvin Coolidge, and Herbert Hoover, from 1921 to 1932, and reduced the national debt from $24 billion in 1920 to $17,604,000,000 by reforming taxation, generally reducing tax rates. The reductions stimulated the economy and were credited with the 1920s economic boom. Mellon fell from favor, however, after the onset of the Great Depression in 1929. 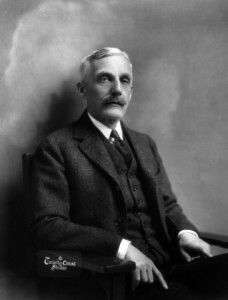 As for Mellon’s philanthropy, it built the National Gallery of Art in Washington, D.C.